A collection of worthwhile notes and factoids followed the 2018 Bill Farrell Memorial on Friday. As trumpeted in our recap, the finals matches pretty much spoke for themselves. Randon Miranda (60 kg, NYAC/OTS), named the tournament’s Outstanding Wrestler, broke through against teammate and fellow two-time Junior World Teamer Dalton Roberts for the first time. That bout was one of two offering a gripping finish, with the other being Alex Sancho‘s (72 kg, NYAC) last-second victory over Chris Gonzalez (NYAC). 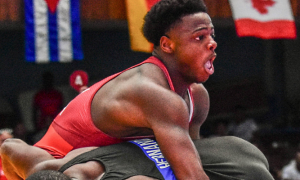 Of course, 2017 Junior World Champion Kamal Bey (77 kg, Sunkist) and Jesse Porter (NYAC/OTS) nearly blew the roof off the place in their latest battle, as well. And then there was Lucas Sheridan (Army/WCAP), who made his season debut at a new weight class and not only looked sharp, but downright imposing as he marched his way to 97-kilogram gold. However, several US Greco-Roman athletes deserved more shine than they got and that group is led by 2017 Senior Trials runner-up Hayden Tuma (Army/WCAP). Like Sheridan, Tuma was stepping back into competition for the first time in nearly a year and did nothing other than dominate virtually every second of his four matches en-route to the 63-kilogram crown. Remember that first part — nearly a year — and there was zero visible rust. How blindingly effective was Tuma on Friday? Check this out. Not one of Tuma’s four bouts reached the second period. His total match-time clocked in at a mere 6:35 (six minutes and thirty-five seconds). He did not give up a point in any of his matches. Before Tuma sealed his first win via fall over tough Marine prospect Taylor Zippe, he was on his way to a 9-0 tech, anyway. All told, Tuma outscored the opposition 34-0 (three tech’s and a pin), and that includes his victory against Sammy Jones, who remains one of the best lightweight Greco athletes in the US. Why is this compelling? Because aside from his first of two Junior World Team appearances in 2013, where he went 60 kilos, Tuma established himself at 66 and that’s the weight class in which he entered the Senior circuit. 2016 saw him drop down to 59, and naturally, that wasn’t a breezy cut for him. “I hadn’t weighed under 60 kilos since I was a sophomore or junior in high school,” Tuma said of originally going down to 60 last year. “It took a little bit of adjusting in how I was eating and working out to make the weight.” Assuming he is able to drop to 60 whilst dealing with the updated weigh-in procedures, Tuma could very well be even more of a monster than he was a year ago. We’ll have more with Tuma coming up later in the week. Also earning his first tournament victory of the season on Friday was 2017 U23 World Team member Alex Sancho (NYAC), who defeated former NMU teammate and ’16 Senior Trials champ Chris Gonzalez (NYAC) in one of the most memorable finals bouts of the afternoon. Just like their best-of-three series 18 months ago, there was a lot of tension permeating throughout this affair. Neither wrestler was able to generate much in the way of offense, save for Sancho’s step-out at the buzzer that gave him the adrenalizing win. But it was still intense before the frantic ending. The anticipation kept ticking upwards as the second period unfolded and when Gonzalez retook the lead with :14 left, the match appeared over. Obviously, that’s not what wound up happening, as Sancho practically went berserk trying to score till the very last second — and did — much to Gonzalez’s chagrin. Leading up to the 2018 Bill Farrell Memorial, Sancho was on the fence as to which weight class he wanted to enter. 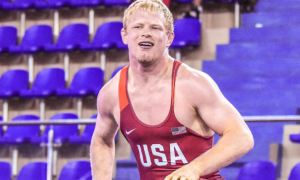 It appears he would still prefer 67 kilos, and all indications are that’s where he’ll be for the World Team Trials two-and-a-half months from now. Nevertheless, he wanted to get a sense of what 72 kilos felt like with a same-day weigh-in. Is it a “just in case” situation? Maybe. Maybe. Sancho, unsurprisingly perhaps, was pragmatic when assessing his overall performance. He likes what the rule update is supposed to offer (more on that in a second) and he was okay with how his finals match ended up. But Sancho couldn’t help feeling as though he left points on the board, and that is one of the reasons why he trekked it to New York in the first place, to workshop his arsenal ahead of the two most important events of the season. Remember the Greco-Roman rule updates that were originally set to roll out after today? Well, they were used at the Farrell. The new emphasis on “negative wrestling” didn’t betray too many differences on Friday to the naked eye, primarily because officials (for the most part) were pretty liberal when it came to athletes hanging their heads in tie-ups. A few bouts did see caution-and-two’s make an appearance but there was little controversy to speak of. It was a solid move by USA Wrestling and the USWOA to fully introduce the new wrinkles, especially given what happened with last year’s Trials when the two-point caution on finger-grabbing caused an uproar in spots. Multi-time National Team member Courtney Myers (87 kg, Army/WCAP) had himself a very strong day and it didn’t even result in a medal. Overall, Myers went 3-2 at the Farrell highlighted by a stunning tech fall over 2016 US National Champion Kevin Radford (Sunkist) and a seven-point blanking of Khymba Johnson (NYAC/OTS, Radford’s runner-up in ’16). His two losses came at the hands of two-time World Teamer Cheney Haight (NYAC) and eventual bronze Joe Rau (Minnesota Storm). Myers’ showing is even more impressive due to the fact he went up to 87. He plans on being back down at 82 for the Trials. Right there with Myers is the aforementioned Haight, who dominated Canada’s Phillip Barreiro via tech and despite some competitive exchanges early on, managed to pin Myers in their semifinal contest. The 33-year-old was subsequently turned back by Mohamed Moustafa (EGY) in the gold-medal-match. Where does Haight go from here? Will it be Vegas? Tulsa? Hopefully both, but if it’s just the latter, then that would be just fine with most US fans. Xavier Johnson (Marines) keeps turning (and throwing) heads. Up at 63 kilograms, he piled up the points against promising NMU fireplug Jordan Auen, took a close loss to Hasan Mustafa (EGY), and capped his afternoon with a bronze following an exciting bout versus Jones. To give Jones credit, he was actually right in it for most of the battle until Johnson broke away later on. But the evidence just keeps mounting. 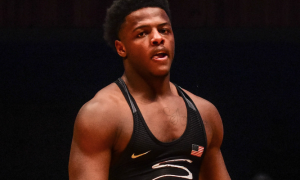 Between the bronze at Zagreb, his win over Ildar Hafizov (Army/WCAP), and now this, Xavier Johnson is an athlete everyone needs to take very, very seriously. Williams Baptist head coach Jonathan Drendel was encouraged yet still mindful of the necessary improvements his squad needs to make after the event on Friday, but the program did welcome its first-ever Senior medalists in Duncan Nelson (bronze, 67 kg) and Sean Sesnan (silver, 55 kg). Nelson’s medal holds a bit more weight than Sesnan’s if only because he only wrestled in the finals. Moreover, Nelson had to claw his way back into contention after losing to eventual champ Ray Bunker (Marines) in the quarterfinals 6-4. For bronze, he defeated Hunter Kelly (NMU/OTS) via tech. A huge number of young United States athletes competed at the 48th annual Easter Wrestling Tournament in Utrecht, Netherlands on Sunday. Recognized as the largest youth wrestling event in Europe, the Easter Wrestling Tournament hosts over 600 athletes from 17 countries each year. So it’s significant. All of the Americans who competed did so under the Legends of Gold banner and the stats are enormous — four champions and 22 overall placewinners. Note: the event did not categorize athletes according to UWW age groups. *Athletes listed in order of medal/placing. The athletes who competed yesterday will now begin a week-long camp in the Netherlands where 2016 Olympian/LOG assistant coach Jesse Thielke (NYAC) is on hand as one of the clinicians. Farrell-heavy posts for this week led off by the 60-kilogram champ. Already moving forward it would seem. Not from New York, but still relevant. We really only acknowledge one style around here, but whatever. The same can be said for “The Bad Guy”.